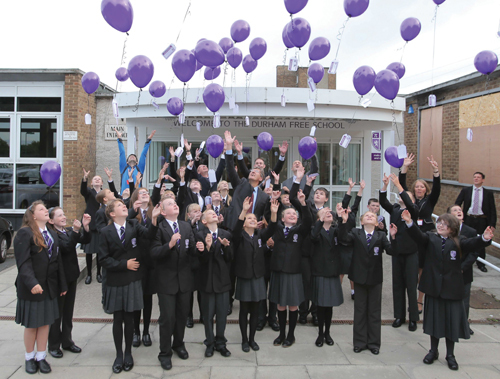 Balloons go up to mark the opening of the Durham Free School in Gilesgate. One of the coalition’s flagship education policies was to establish free schools, which can be set up by anyone. The idea was to allow leadership and to encourage communities to address their own needs. But in practice, it hasn’t always worked out well. In a piece for the New Humanist, I examined a specific type of free schools: those with a “religious ethos”. I visited Durham to report on the closure of a Christian-ethos school there. The controversy in Durham feeds into two separate debates. The first is about the success or failure of the free schools programme. (The Labour Party has been highly critical, and made it a manifesto promise to overhaul the policy). The second is about the wider role of faith in education. The two issues are clearly linked. A recent report by the government’s Social Integration Commission warned that Britain’s education system is increasingly “segregated” along lines of social class, religion and race. It said that free schools have contributed to the fact that children increasingly spend their formative years in surroundings “dominated by a single faith group or community”, and advised that no further faith schools should be allowed to open unless the groups planning them can prove that pupils will mix with children from other backgrounds. The rest of the piece is here and the clipping is below. (NB I’ve written on education policy before, notably in this article for the New Statesman about Hackney’s Mossbourne School).